For any mining operation, effective wastewater treatment to remove contaminants is an indispensable step needed to minimize environmental impacts and maintain the mine’s social license to operate. When elevated concentrations of ammonia and residual cyanide by-products were detected in mill effluent at Éléonore in 2014, the mill and environmental team took decisive action by introducing a novel wastewater treatment process that rectified the problem and secured Éléonore a Global Excellence Award for Sustainability Stewardship. Following Éléonore’s mill start-up in 2014, the new process water bleed (discharge) to water treatment plant (WTP) and paste backfill process resulted in increased concentrations of contaminants in water effluent. Even though the cause of the ammonia and residual cyanide toxicity couldn’t readily be identified, the Éléonore team immediately notified all major stakeholders, such as the Quebec Environment Ministry, Environment Canada and the Cree Nation Government – Environment Committee of Opinagow Collaboration Agreement, informing them on the extent of the problem and plans to rectify the situation. During 2015 and 2016, the Éléonore team developed an action plan, investigated various water treatment options, and proactively executed a series of projects including cyanide detox and leaching circuits optimization to reduce effluent contamination. The team also worked on mill water balance through its zero-bleed project with the objective of reducing contaminant process water discharge to the WTP, which involved reducing fresh water consumption by replacing water-sealed pumps used in the mill with mechanical seal pumps. These projects increased control of process water contaminant concentration but didn’t resolve toxicity issues. A consultant working on the toxicity problem recommended the Éléonore team consider zeolite treatment and a Moving Bed Bacteria Reactor (MBBR) system to process wastewater effluent. Zeolite is a mineral well known for its ability to absorb a variety of heavy metals and ammonia. MBBR, more commonly used for municipal water treatment, is an activated bacteria aeration system, where bacteria collected on porous plastic carriers breaks down organic matter from wastewater. A pilot project found that zeolite treatment removed ammonia but did not eliminate the toxicity. MBBR, on the other hand, could remove ammonia and cyanide by-products delivering non-toxic results at low water temperatures (8°C). 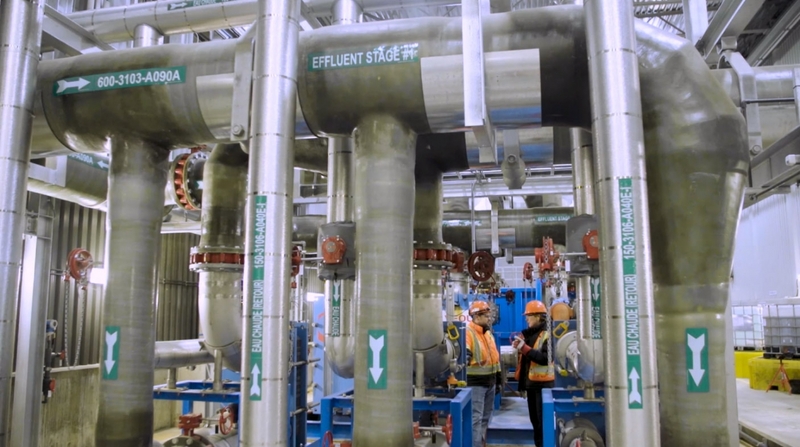 In Spring 2016, the Quebec government granted approval for Éléonore to expand its water treatment plant by adding MBBR treatment while continuing to reduce its process water discharge to reach a zero-bleed operation. Construction got underway in fall 2016, and the MBBR treatment plant was commissioned in May 2017. Energy efficiency was one of the critical plant design considerations to minimize heating requirements in winter. The addition of a heat exchange system and an insulated water circuit ensured that process water could feed the MBBR to keep the bacteria-activated treatment as stable as possible during cold winter months. Now at the second winter, treatment is achieved without any heating at a temperature around 5°C. From concept to completion, Éléonore workers were kept up to date on the project’s progress through regular on-site presentations and stakeholders informed of the mine’s plans through monthly reports, quarterly presentations and site visits. “Consistent communication really enabled us to demonstrate how serious we were about solving this problem, which was essential in helping secure support for this project among stakeholders and regulators,” added Trépanier. Following the MBBR ramp up, Éléonore reduced ammonia and cyanide by-product concentrations in its effluent by more than 90% and was designated 100% in compliance with water quality regulations in October 2017. Since MBBR has been in steady operation, mandatory effluent sampling frequency returned from weekly to monthly.